The Voluntary Local Review (VLR) is the result of the Global Vision / Urban Action programme of the Mayor’s Office for International Affairs. Global Vision | Urban Action is an innovative initiative born in 2015 that aims to engage experts and representatives from New York City and the international community interested in achieving the global goals, as well as raising awareness on sustainability at local level. “New York City is showing how localities across the country can implement the UN’s Sustainable Development Goals. Through OneNYC, we’re implementing a bold strategy to make our city more sustainable, equitable and healthier. Our approach is working: our air and waterways are cleaner than ever, we’re creating opportunity for New Yorkers across the city, crime is at an all-time low and we are tackling the challenge of climate change. We look forward to continue working with municipalities across the nation and the world to learn from them and share the strategies that have succeeded here” said Bill de Blasio, Mayor of New York. The VLR follows the example of the Voluntary National Reviews (VNRs), that review the progress made by the UN member states on the SDGs and are debated every year during the HLPF in New York. This year’s theme is "Transformation towards sustainable and resilient societies" and SDG 6, 7, 11, 12 and 15 will be under review. 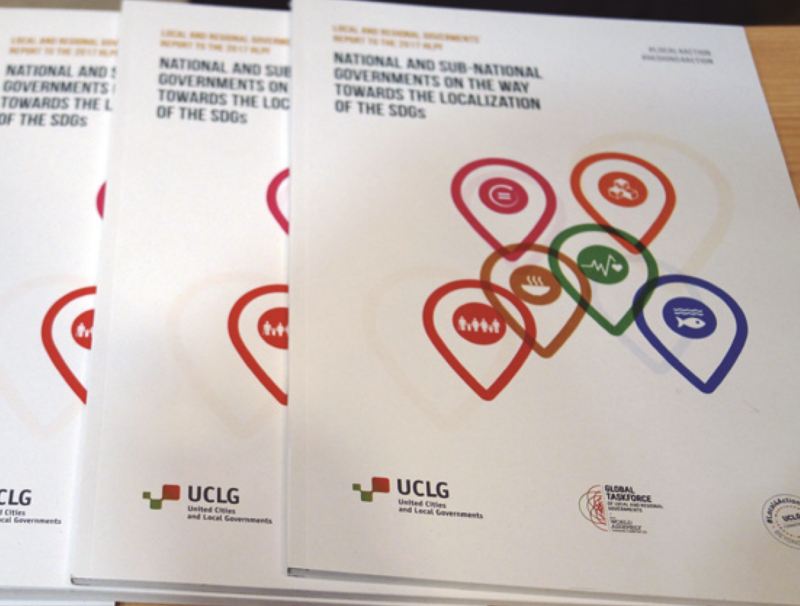 The localization of the SDGs was adopted by UCLG as a strategic priority for the 2016-2022 period at the UCLG Executive Bureau in Madrid in 2017, taking into account that, as a global network, it is our duty to assume an active role in guaranteeing the exchange of information and promoting commitment to the SDGs and the other global goals. "Cities are key for the achievement of the global goals and we are thrilled that New York City is one of the pioneers to report on their contribution to achieving the Sustainable Development Goals, improving the lives of New Yorkers and setting an example for thousands of cities around the world” Emilia Saiz, Secretary General, United Cities and Local Governments. The first Forum of Local and Regional Authorities will take place on July 16, within the programme of the HLPF, and will be the platform in which our message, inputs and expectations will take the stage and be given their due visibility and centrality. A strong delegation of mayors is expected to attend to call for the inclusion of the perspective of our constituency in the global assessment process discussed at the 2018 HLPF and to highlight the critical role of local and regional governments in the monitoring and reporting process of the SDGs. Facilitated by the Global Observatory on Local Democracy and Decentralization (GOLD), UCLG, on behalf of the Global Taskforce of Local and Regional Governments, is preparing the second edition of its report of local and regional governments to the HLPF. The first edition of the report was submitted to the 2017 HLPF, and analysed the 63 VNRs presented in 2016 and 2017, alongside the findings of 25 responses to a survey on the localization of the SDGs, as received from local government associations from all regions of the world. This year, UCLG is updating its report with a compound analysis of the 47 VNRs to be submitted in 2018. GOLD has distributed an updated Survey on the Localization of the SDGs, with a few core questions that may guide local governments and their associations in providing a picture of how implementation of the global goals is taking place at the local level. As of April 2018, GOLD has already received 28 replies, 13 of which are from countries reporting to the HLPF this year. The process to receive responses is still open in order to collect even more feedback from the local level. The report will also build on an extensive analysis of SDG 11 on Sustainable Cities and Communities – which will also be assessed by the HLPF this year and has of course special relevance for the constituency of local and regional governments – but will also highlight the linkage with other relevant goals assess in the Forum. The report will also feature a section on Leaving no one behind, which will address core issues of inclusion and migration, consistent with UCLG’s prospective agenda of issue-based Waves of Action. The report will count on regional reports from dedicated expert teams as well as on tailored contributions from fellow international organizations and institutions (C40, ICLEI, UITP among others), providing state-of-the-art expertise and knowledge on relevant targets of SDG 11 (housing, mobility, planning, just to name a few) and other SDGs such as SDG 6 on water, SDG 7 on energy, SDG 12 on responsible consumption and production, and SDG 15 on life on land. Visit Global Vision / Urban Action website. Read the "Global Vision, a city with Global Goals" publication.